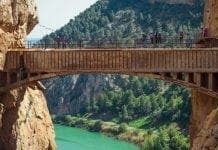 SUMMER tickets are now on sale for the Caminito del Rey in Ardales which killed five people in two years. 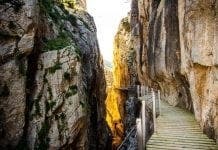 Thrill seekers are raring to take on the four-hour trek along the precarious wooden walkway tacked to the precipice of a gorge. Since the fatal incidents 15 years ago, it has been renovated under tighter safety regulations. 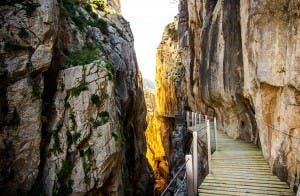 The pathway is now secured to the gorge with metal bolts, and visitors are required to wear helmets while they walk across the 300ft-high path. It was built more than a century ago so that hydroelectric plant workers could gain easier access. Since then it has been used by hundreds of thousands of adrenaline-seeking tourists, and for an extra thrill, there is a glass platform there you can get an uninterrupted view below. Tickets cost €10 and must be reserved in advance.